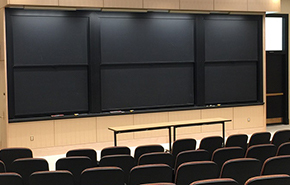 The classrooms managed by the Registrar's Office are vital academic and community resources at MIT. We work closely with faculty, staff, and the Association of Student Activities (ASA) to allocate space for academic instruction and exercises, meetings, and special events. We also oversee classroom renovation and maintenance with the goal of providing faculty and students with enhanced, active learning environments. Use Classrooms@MIT to browse inventory, request an ad-hoc reservation, or find space for an impromptu meeting or study session with QuickRoom. Download our QuickCard for assistance with Classrooms@MIT. View Schedule of Classes for information about class locations, times, and descriptions. Check out our recently renovated classrooms. Need to report a problem or unlock a classroom? During normal business hours — call (617) 253-4788 or email schedules@mit.edu. After business hours — contact the Department of Facilities at (617) 253-1500.